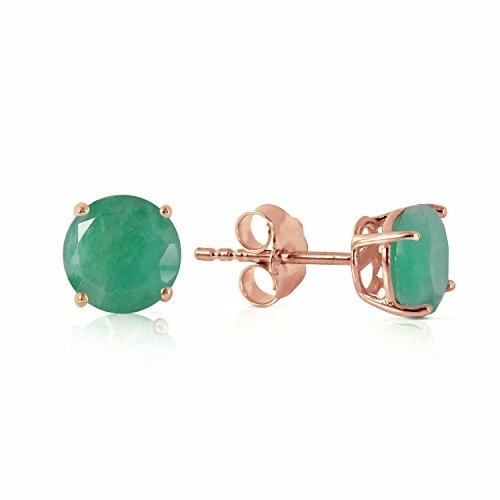 Natural gemstone'studs are a classic, and these 14k rose gold stud earrings with natural emeralds are an amazing and stunning piece to add to any collection. Two round cut natural emeralds reflect their brilliance and beauty in the perfect size, weighing just under one carat total. Gold settings and posts are secured with friction push backs, all crafted in your choice of yellow, white, or rose gold to suit your own style. These earrings are simple, but will always be in style. Emeralds are a natural gemstone that have inclusions which make each stone unique and beautiful without taking away from the sparkle or color of each stone.